At the same time that I was contemplating tackling a photo book for the Land in Hand exhibition, I began to think about another artist book. For some time, I have been gathering photographs and more latterly a series of paintings loosely on the theme of woodland and how people use and abuse them. The series of paintings already had a title “We’re not out of the Woods yet”. This suggested a number of different meanings and interpretation. The U-turn by the Government on selling off woodland was by no means an end to selling off public forest and “wild” land, so I raise an alarm that we may still have forests, but we shouldn’t take them for granted. It references the time of austerity, but also on a wider cynical note it could refer to the fact that in many ways human cultural development has barely made it beyond a time when we lived in the woods. I had run out of steam and inspiration with the paintings, but the series did not feel like it was sufficient to make an exhibition. Combining images of the paintings with photographs seemed to fit well. Then on reading haiku by Colin Blundell, I realised that many of his poems included specific trees, conjuring images very close to those I had actually painted or photographed. So the logical conclusion was to collaborate with Colin and include a selection of his haiku alongside my images. Arguably, since haiku is supposed to capture a moment objectively without emotion, it seems “wrong” to link them with an image in this way, since the image impacts on the poem to create a new meaning. But that in itself is an interesting experiment. My photos and Colin’s poems describe independent moments, so putting them together creates a dialogue across time. The book was put together as a “concertina” folded single stream of images constructed with 6″x4″ prints so that each image is on 8″x6″ unfolded double spread. Each spread was carefully edited to size and position the image and text. The individual images were compiled so that they formed a loose narrative. 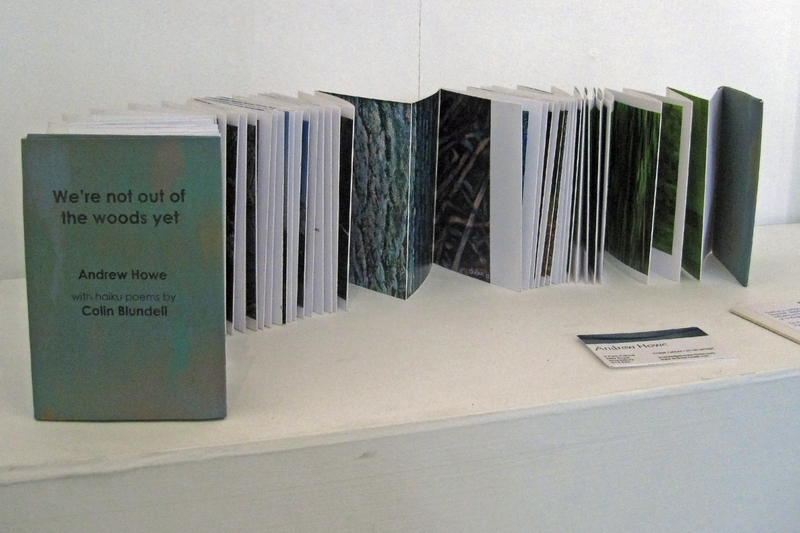 I produced a limited edition of 25 of the books, currently retailing at £36 and their numbers are dwindling already.